The sublime contrast of porcelain ivory overlaid with pale raspberry veination make this one of our all-time favorite parvi hybrids. Wide petals and a semi-inflated pouch coupled with compact growth habit make this hybrid perfect for the under-lights grower.Twenty-five seedlings vigorously growing seedlings in each compot should be ready for individual pots later this summer. A sib cross between two excellent examples of this beautiful species from China. One has oustanding color, the other above average size. The dorsal sepal and petals will be rose-pink with faint yellow veins; the bubble-gum pouch will be inflated and pink-pink-pink. Seedlings have 5-6 inch leaf spans and should bloom in 18-24 months. A wonderful sib cross of two of the best examples of this popular, easy to grow species from north-east Thailand. 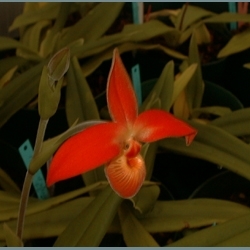 The 'York' AM/AOS clone has particularly wide petals and the 'Liisa' clone - one of Dr. Clement's best (see photo) - has exceptional color and size. Compots have twenty to twenty-five seedlings that will be ready for individual pots later this summer. A remake of an old favorite using high quality, modern parents. The besseae parent is one of Dr. Clement's best, un-awarded clones and the schlimii parent one of the finest modern clones to come out of Colombia. Seedlings have nominal 5 inch leaf spans and are growing vigorously in 2 1/4" pots. Various adult clones to bloom in season. These are all divisions of Ecuadorean plants that were imported in the early 00's, and were selected for their flower color and ease of culture. Many are still in use in our breeding program, but we no longer have the space to keep growing them all. Shipped bare root, with roots wrapped in damp sphagnum moss. A selfing of the only Phrag. d’alessandroi to be positively identified by it’s discoverer, Dr. Cal Dodson, prior to it's CHM/ AOS award. Flower stems branch readily, stolons do not try to crawl out of the pot and flowers are brilliant orange with a distinct yellow blaze at the petal juncture. Seedlings have 6-7 inch leaf spans and should bloom in 12-18 months. The final release of our remaining albino Phrag. longifolium fma album seedlings. As mentioned before, this is the only albino Phrag. species ever found and is extremely rare. Seedlings have nominal 8-10 inch leaf spans and should bloom in 18 months or less. Shipped in-pot. Limited. A sib cross of two of the finest examples of this popular Ecuadorean species we've ever seen. Flowers are pink, with a deep rose-pink pouch and pale pink petals and synsepal. Prefers intermediate conditions and wonderful for the under lights grower wanting a more compact growing Phrag. with brightly colored flowers. Seedlings have 6-8 inch leaf spans and should bloom in 18 months. 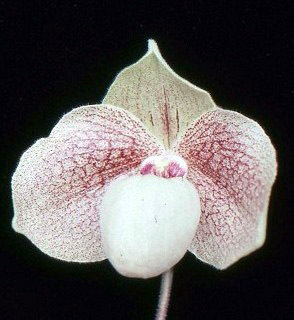 One of the rarest finds in Phragmipedium history, this species grows in dry swamps in the state of Minas Gerais, Brazil. Extremely difficult to propagate but relatively easy to grow, this would be a wonderful addition to any collection. The price has been reduced substantially because we have been fortunate enough to have had fairly good germination in the lab. Seedlings have nominal 10-12 inch leaf spans and will be shipped in-pot with growing instructions.